Carrots are incredibly healthy vegetables, rich in vitamin A, that strengthens the immune system and improves vision, vitamin B6, and beta-carotene, which lowers the risk of cancer. Moreover, vitamin A treats respiratory problems and soothes asthma and other lung issues. Therefore, carrots are incredibly helpful in the fight against coughs, since they are a natural respiratory-aid, and effectively treat common colds. “Coughing ranks among the most common health problems. When there is an irritant or blockage in your throat or upper air passages, your body gets a message from the brain to remove the irritant by coughing. 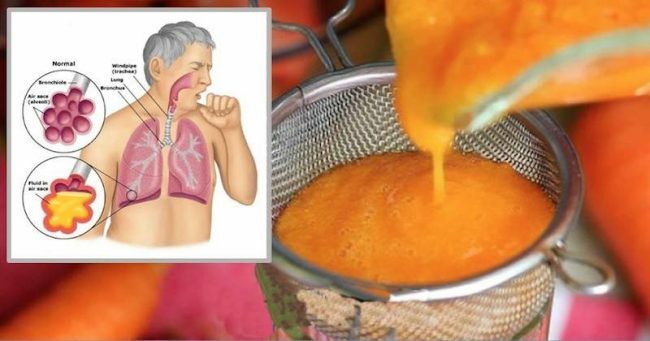 The following homemade cough syrup combines the beneficial properties of carrots and honey, which is a powerful antibacterial that relieves coughs and treats respiratory illnesses. Dice the carrots, and place them in a stainless steel pot. Then, fill the pot with water in order to submerge the carrots, bring to boil, and simmer until the carrots are softened. Remove the pot from heat, take the carrots out of it, and mash them using a fork. Add the honey to the leftover carrot-water, and then add the mashed carrots. Blend until you get a homogeneous mixture. Store the syrup in the fridge for up to 3 days. Take 3-4 tablespoons of the syrup daily, and you will feel the improvements almost immediately.